Tempo and Speed: Are you comfortable? I am nine weeks into my sixteen week training for the half-marathon that I will run in May. I ran the same race last year but did not really train. My preparation last year consisted of about twelve weeks of consistent running about 3 times a week, slowing increasing my weekly mileage to a point where I could run 10-12 miles in one go. I think I had run 14 miles once before the race last year. I did this with the support of a great friend who ran all those miles alongside me. She ran these slow, sometimes painful miles with me even though she is a much more experienced runner and could easily run faster, longer and harder than I was capable of. She likes to help people and has a gift of quiet encouragement. Thanks, LP! Now LP and I, along with another great friend, KB, are training, really training for the same race. I say really training for a few reasons. One, we are actually following an established half-marathon training regimen. Two, we each have set time goals. 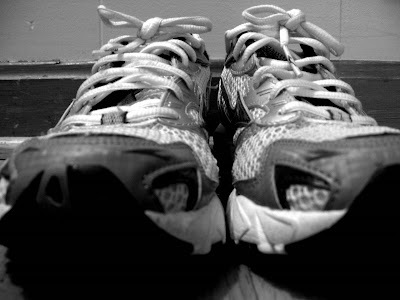 Three, I either am running, thinking about running, planning a run, or talking about running most of the time. I am a 40-something mother of 2 children. I have never been athletic in my life. My legs are so short that they propel me at all is a feat of physics. I never liked to run. I don't like to get sweaty because that just leads to the need for showering again which is an issue for me due to my thick, coarse, unruly hair that doesn't agree with daily washings. So you see the odds are stacked against me being an elite athlete. But in my own little world of running, I am Pheidippides. I run like the wind. I am my own butterfly effect, changing forever the notion of what my body is capable of. All this may sound over the top and even a bit nauseating to many of you, but you runners will understand. For the rest, if you've ever committed to something that was hard and took as much out of you as it gave back and if you've finally seen results and wanted to try harder just to get more and if you doubted your abilities only to prove yourself wrong and if you've pushed yourself past your comfort zone to then realize that those comfort boundaries were placed too close from the start, you understand too. What are you doing to reset your comfort boundaries? Not a runner but I relate to the message...on another note-who wrote the book you are reading? Just curious...always looking for new books. I'm reading Blood River: A Journey to Africa's Broken Heart by Tim Butcher. He was a journalist for The Telegraph in London and re-created Stanley's trip down the Congo river. It's good, not light, but really interesting and very readable. O.K. smart running girl...your words are well spoken. I am happy to be on this journey with you and to have you by my side! Every step (literally) of the way. Fun Run!!!!!! Two little words God never intended to be in the same breath. You go girl. I have known you when you wore zebra boots rather than running shoes.